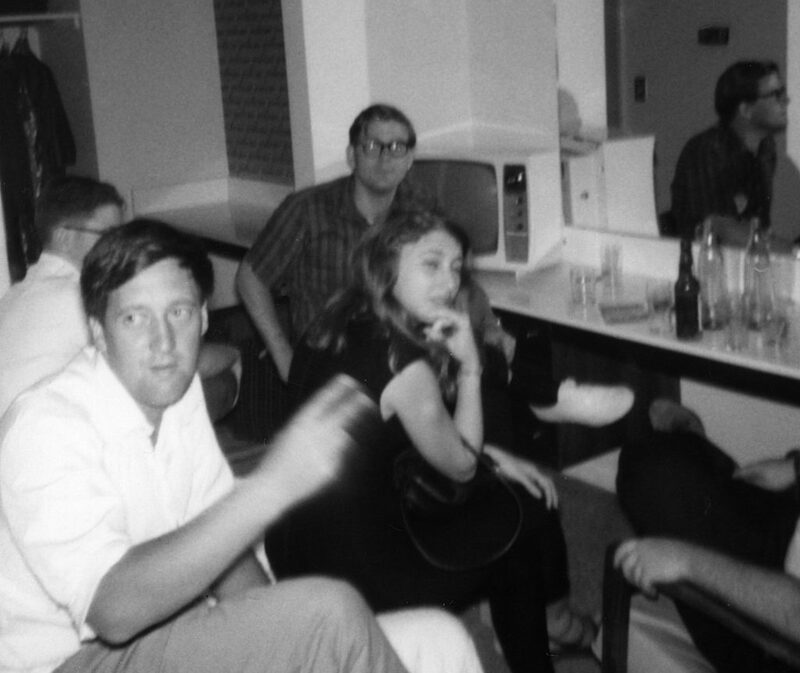 George Locke in foreground, with Alexei Panshin [rear] and Marsha Elkin/Jones/Brown). Photo (c) by Andrew Porter. British fan, bookseller, and author George Locke died February 1 at the age of 82. His first published sf story was “The Human Seed” for Authentic Science Fiction in October 1957, and he wrote a number of stories under the name Gordon Walters in the 1960s. The SF Encyclopedia has full details of his career. Also an active fan, he was one of the organizers of IPSO, the International Publishers’ Speculative Organization, the second British APA, founded in April 1961. He was on the RePetercon committee (the second British Eastercon, 1964). The SF Encyclopedia credits his many important bibliographical works, beginning with the Ferret Fantasy’s Christmas Annual series (1972-1975) containing reprinted fiction along with short bibliographies of this material. The series inspired his work on Science Fiction First Editions: A Select Bibliography and Notes for the Collector (1978), and a later anthology, Sources of Science Fiction: Future War Novels of the 1890s (1988) designed for institutions. Locke also produced bibliographies of works in the category of nineteenth-century interplanetary romance, Voyages in Space: A Bibliography of Interplanetary Fiction, 1801-1914 (1975) and, in enormously expanded and sophisticated form, Voyages in Space: The Interplanetary Theme in Creative Writing to 1914: A Researcher’s Companion (2011). SFE calls his Spectrum of Fantasy sequence of annotated bibliographies Locke’s central accomplishment in the field: A Spectrum of Fantasy (1980) A Spectrum of Fantasy II (1994) and A Spectrum of Fantasy III (2002), plus two ancillary volumes, Spectrum of Fantasy: Christmas Annual 2002 and Spectrum of Fantasy: Christmas Annual 2003-2004. This entry was posted in In Passing and tagged Andrew Porter, George Locke by Mike Glyer. Bookmark the permalink. George also did a lot of valuable work on 19th century Gothic ‘dreadfuls’ and was a mine of information on story papers and other periodicals. I was very fond of him and my thoughts go to his family in South London, where he lived all his life.